Bernie DVD Review Bernie is an odd bird, to be sure - part dark comedy, part star vehicle, and simultaneously a quaint examination of backwoods foibles and a compelling character study dotted with real-life local standouts, many of whom profess an unwavering regard for the man they believe should walk free regardless of the crime he is alleged to have committed. Based on a true story and evidently largely faithful to the fascinating facts that comprise it, this singular film offers a recounting of the events leading up to the 1987 murder of wealthy 82-year-old Texan widow Marjorie Nugent at the hands of Bernie Tiede, her decades younger friend, confidante, travelling companion and de facto hired help. The charismatic Tiede was an assistant funeral director by trade and something of a local celebrity in the small Texan town of Carthage where both resided. Though it was universally agreed by the wizened old timers and gossipy harridans that passed for town elders that Bernie was ‘a little light in the loafers,’ this proved no impediment for the irrepressible charmer, who in addition to performing admirably at his day job was a noteworthy preacher, singer, philanthropist and man about town - in short, he was possibly the most beloved and indispensible social gadfly ever to grace small town America. For whatever obscure reasons the seemingly asexual Tiede reserved a special place in his heart for older women, who responded almost universally to the genuine warmth he bestowed upon them with nothing short of adoration. So it was that Nugent, a viper-tongued and cantankerous old shrew abandoned by even her own children, came to consider Bernie the closest thing she had ever had to a friend. The improbable pair spent years jetsetting around the world, taking in shows, staying in expensive hotels, sipping cocktails on exotic foreign beaches and flying first class - all, of course, on the considerable dime of the elderly Mrs Nugent. Eventually, however, her acid tongue and continual disparaging of her sensitive companion caught up with the waspish octogenarian, and in a moment of uncharacteristic rage Bernie shot her dead. Such was his standing in the local community though that even following his confession the prosecution requested the trial be moved to a neighbouring county - Bernie was so well liked locally that it was feared no one in Carthage would convict him, especially considering Nugent had been as despised locally as Bernie was admired. Much like Adam Sandler did in the sublime Punch Drunk Love before he went back to steadily pumping out dross, Jack Black draws on the deepest tragicomic elements of his persona to deliver a performance that is at once multifaceted, kookily amusing and improbably poignant. He immerses himself completely in his role as universally adored eccentric - his behind the scenes interviews show him staying in character even between takes - and the eminently convincing end result has seen the portly jokester receiving some of the best reviews of his career. 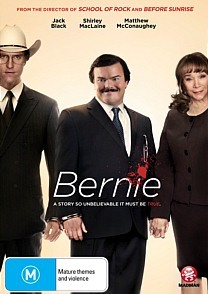 Bernie is an odd bird, to be sure - part dark comedy, part star vehicle, and simultaneously a quaint examination of backwoods foibles and a compelling character study dotted with real-life local standouts, many of whom profess an unwavering regard for the man they believe should walk free regardless of the crime he is alleged to have committed. In addition to Black’s impressive turn we are also treated to notable performances from Shirley MacLaine and Matthew McConaughey, and director Richard Linklater keeps the storyline bubbling along at a brisk pace. Never a dull moment, and plenty to admire. Three Featurettes with a combined running time of 30 minutes explore the film’s lengthy gestation period, Black’s joining of the project and the scriptwriting process, as well as providing audition footage of the local ‘Gossips’ whose recollections came to form an integral component of the film. There are also a further 10 minutes of Deleted Scenes, and the usual smattering of Trailers.